This is a wide topic that can be “dismantled” in so many “pieces”… but! possible as pyramids to be build as a sort of churches, “cosmopolitan” locations or simply for religious purposes, hiring all labor force at that time, keeping them busy without thinking. I cannot think at pyramids being brought up by our direct ancestors cause, obviously, are missing few links mandatory to complete a normal evolution flow, plus, apart one from the other one, they were erected in different styles during same period of time. So, how did they manage to build those gorgeous, majestic and impressive pyramids, in fact, at that time? From where that strength, whole that technology and mechanisms to lift up those billions of humongous blocks of stones? How that all those blocks have, mostly, the same perfect shape and weight? Why are pyramids quite isolated by any other common (archeological) construction? Why it is said that’s possible to see them from the Moon and outer space? Why in most of them were found mummies and their presumed dearest belongings (supposed family members and/ or goods), what was their purpose? To pay a visit to Egyptian pyramids is something that I‘d really wish to experience one day - to have the opportunity to go to the real pyramids and ancient vestiges and shrines; not the ones opened for tourists, but the other ones still located in initial place, a bit far from Nil; to have access inside, be allowed to touch cuneiform and mummies, feel those stones and old layers of dust, walk along the walls feel, listen and pay required respect to all the shadows of those intriguing spirits throughout all sunlight stages (sunrise, twilight, sunset) closing the circle passing thru moonlight and midnight. 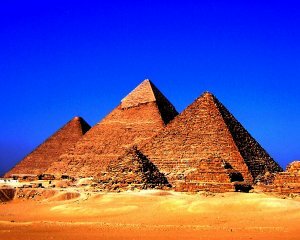 What do you think about the Egyptian pyramids?